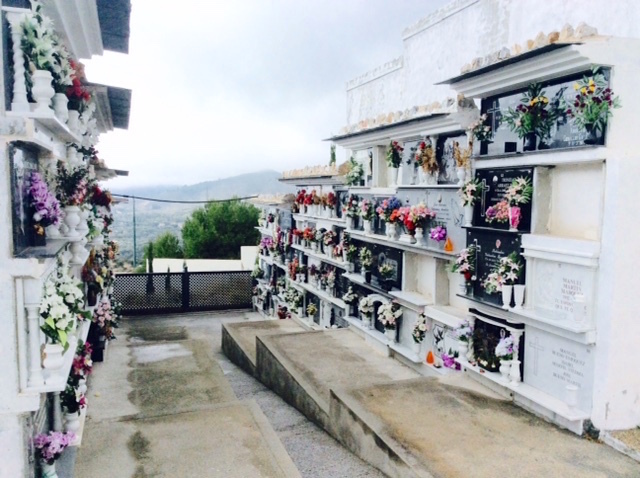 High above Órgiva a pine-clad hill is punctuated by a white, three-metre-high walled area: Órgiva’s cemetery. Today in the drizzle we headed up there for no reason other than to enjoy the amazing view of the Rio Guadalfeo valley and the Sierra de Lújar. A duvet of battleship-grey clouds slid eastwards across the mountains while the sun warmed the air beneath; it was like being in some gigantic tent. The weather was similar on the same Sunday last year when we witnessed the flag raising at the Guarda Civil. 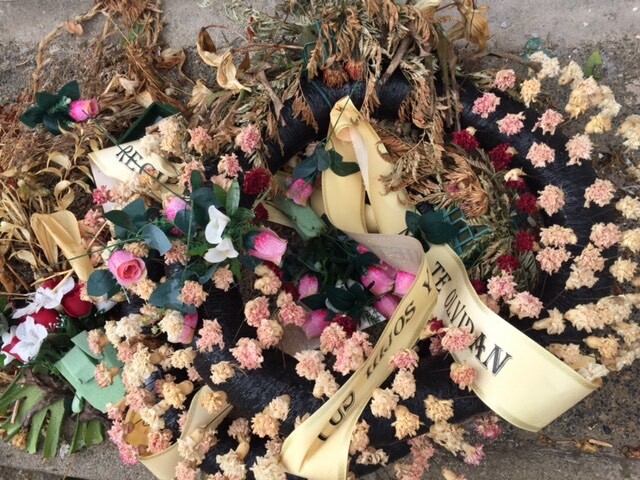 We left town near the children’s playground and shortly after the wine warehouse turned right onto the winding road – repaired in 2010 after heavy flooding – leading to the cemetery. Peering through the iron gates we realised why ‘flower’ shops sold so many plastic ones: to put on graves. There was no birdsong nor breeze – it was like we were in a vacuum, but getting more damp by the minute. The tombs were beautifully engraved, many with oval, glass-sealed photographs of the deceased; also with D.E.P Descanse En Paz (Rest in Peace). 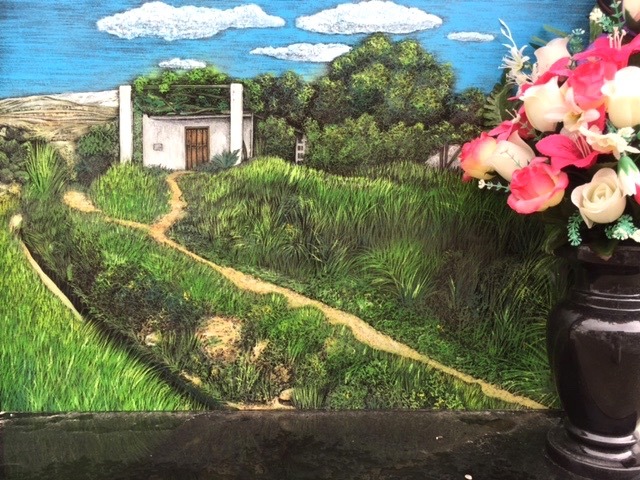 Names we recognised – Orellana, Moreno, Rodríguez – sprung out as did, poignantly, that of Martin Zaragoza who once showed us around Órgiva’s library devoted to Cervantes. His tomb faced a barren area, still within the walls, waiting to house the deceased in the years to come. 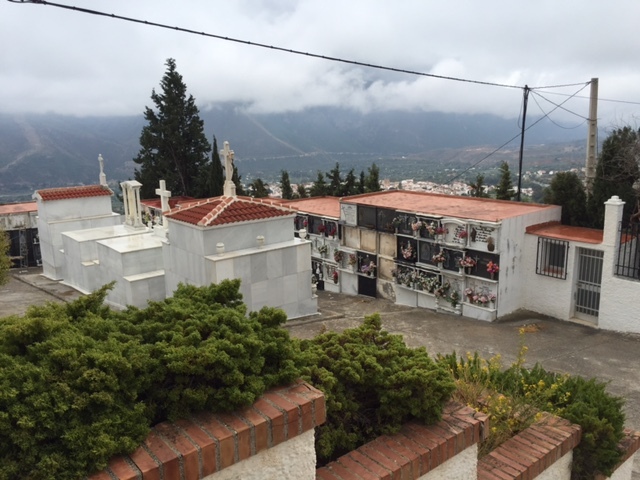 Some families, who may have been in La Alpujarra for many years, have reserved their collection of niches – so, one by one, they can occupy their space when the time comes. A simple memorial to some of the first victims of the Spanish Civil War stands near the entrance. 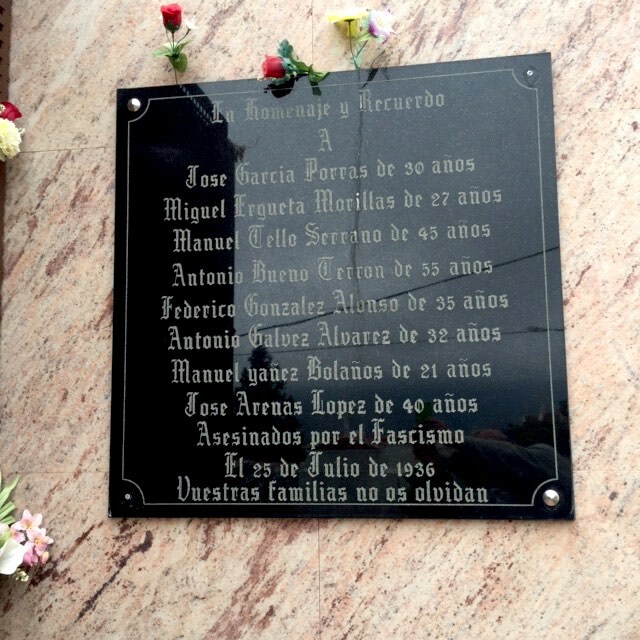 They were the first victims of Órgiva killed (on 25 July 1936) at the start of the war by Franco forces. 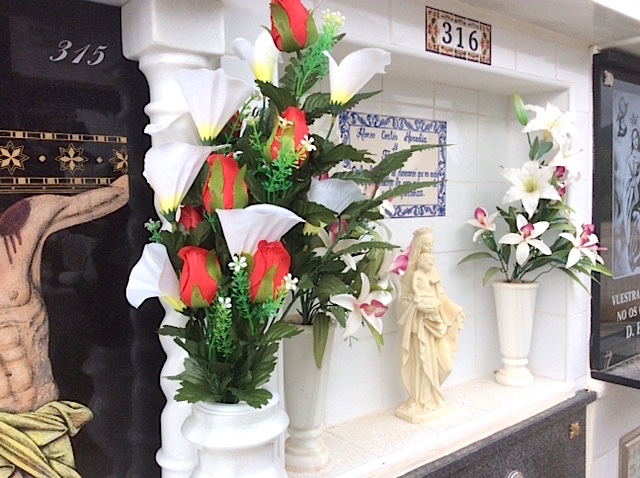 Their remains, originally buried in Tablate cemetery near Lanjarón, are now here, via Órgiva’s old cemetery where, unrecorded on official Andalucían documents, there were graves of civil war victims. It caused controversy a few years back as relatives of the dead fought to have the area excavated, prior to new building work in the town. Most of the people here had a good send off, have pristine tombs and get visited by relatives (a group arrived while we were here). But a few kilometres away – on the road between Órgiva and Lanjarón – thousands lie undiscovered. It’s possibly Spain’s largest mass grave, formed during the Civil War. More on that another day. We went there one lovely sunny evening–a bit of a hike on a full stomach, but a great alternative way to get to know Órgiva. Intrigued to hear about the mass grave.